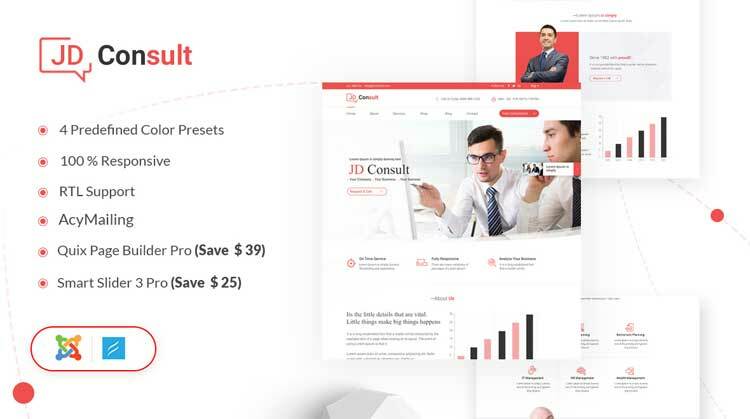 JD Consult is responsive and cross browser compatible Joomla template, best suitable for business and ecommerce websites. It comes with multiple shop page layout and different pre build landing pages and powered with next generation drag and drop page builder. J2store integration makes this template more powerful. You can setup your online shop in just few moments and start selling online. J2store's powerful and user-friendly admin panel let you manage each and everything easily and in a perfect way. JD Consult includes fully SEO friendly, highly optimized code, responsive and fast loading layout which helps you to convert your visitors in to your audience. Its trendy and attractive design and features enables you to develop any niche website whether it is business, corporate, agency or online shopping website.